Prompt: Find two different contracts from separate teams within the same game, argue for why one contract makes more sense than the other. How would you fix the “bad” contract and why is the “good” one the standout? Take a stance on Unionization in esports and create an argument for why it should/should not be implemented. How will it work? Is it game specific? Is it nation specific? Identify and research an issue in the assigned reading and in your independent reading. Feel free to consult and explore a wide variety of resources! , (200-750 words). Post this summary in SMWW e-Arena in the Week Five Discussion Board by Friday. Have some fun with the discussion of this week’s theme. I’ve done literally all of my reports on the Overwatch League, so I thought for once I could branch out and look at a different esport (it helped that OWL is very secretive with their contracts and nobody’s posting theirs online!) So I decided to look at Dota 2, another very popular esport made by my favorite game studio, Valve. 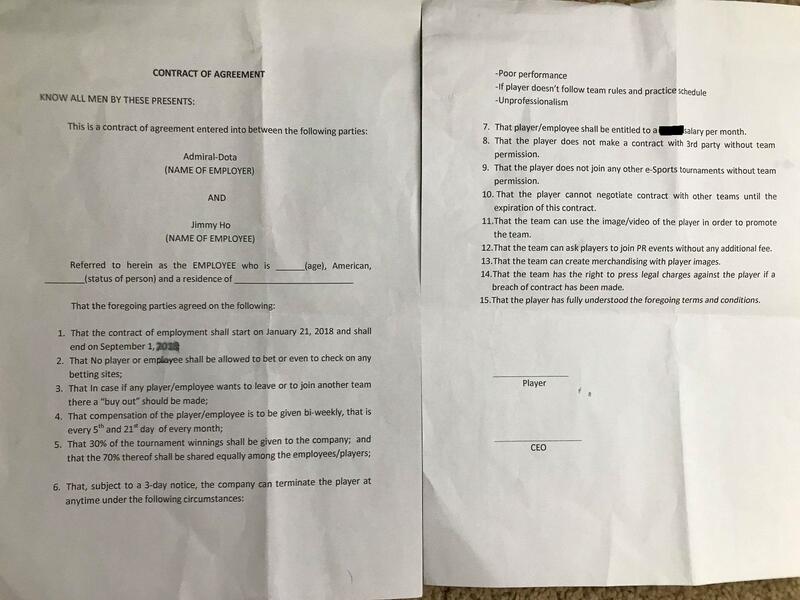 The first contract I found was for a player named SingSing who was joining the team ‘RattleSnake Gaming’ for a period of three months. Overall, I found it a relatively fair-looking contract. The most important part (how much money the player makes) is spelled out clearly and variations are defined with hard numbers. The biggest problem with the contract, in my opinion, is the mere 1 week’s notice for renewal or not-renewal of the contract going forward. That wouldn’t be nearly enough time for me to sort my future out, and would basically leave me at the mercy of the org once approaching the end of the three months. But all in all, I’d probably still sign RSnake’s contract before the other Dota 2 contract I found, this one for a player named DeMoN potentially signing with Admiral. Before I start complaining about it, I must note that the salary and winning %age are clearly spelled out, which I always consider the most important part of a contract. However, while it does a good job stating clearly what responsibilities the player must fulfill, it gives the org far too much leeway in dropping the player with only 3-days notice. “Unprofessionalism” is a very open-ended term with pretty much no oversight or universally-agreed upon definition. In addition, the contract gives the org permission to use the player’s likeness/image with no stipulation on length of time. As I’m reading it, it appears to give them permanent rights to the player’s likeness even after the player has stopped playing for the team. The “buyout” value is not specified in any way. What does it cost if I want to leave early? Unlike RSnake, there are no mentions about the org covering travel or lodging expenses. Honestly, the team appears to do very little for the contractor as per their stated responsibilities in the contract. The good contract needs very little adjustments, I would simply insist on some more solid numbers regarding what the org will be spending on travel/lodging etc. The 1 week seems rather short, but I suspect it wouldn’t be enough to stop me from signing. The bad contract needs far, far more explanation on what the org is responsible for and what the player is getting from the contract. Right now it seems like he’s signing away almost everything and getting nothing in return other than a spot on the team. I strongly support the unionization of competitive esport players, just as I support unionization in every new industry (especially ridesharing, not to get too off-topic but holy cow does Lyft and Uber abuse their contractors’ rights). Sports are already a messy and complicated business, subject to all the moral and legal shortcomings of entertainment plus the increased chance of workplace injury and a competitive environment that encourages overworking yourself. Without unions, esport players are at a disadvantage when negotiating their terms with the orgs, and in many cases they have little option but to accept a bad contract just for the chance to get on stage and show themselves off. If pretty much every other sport gets a union, esports deserve them too. I feel like we could just have one giant esport players’ union rather than different unions for each game, since every esport has identical equipment costs. I guess we could segregate unions by league, but my worry is that it would give Riot and Blizzard too much power; what’s to stop Blizzard from telling the hypothetical Overwatch League union “I don’t care what you want, you gotta play by our rules or we’ll drop you for those who will”? With a global union, there would be pressure from other developers who don’t want to see their players go on strike because of something happening in another league. Esports Week 4: Studying SMART!